﻿ The Macro Tourist | ONE OF THE GREATEST SQUEEZES OF ALL TIME? 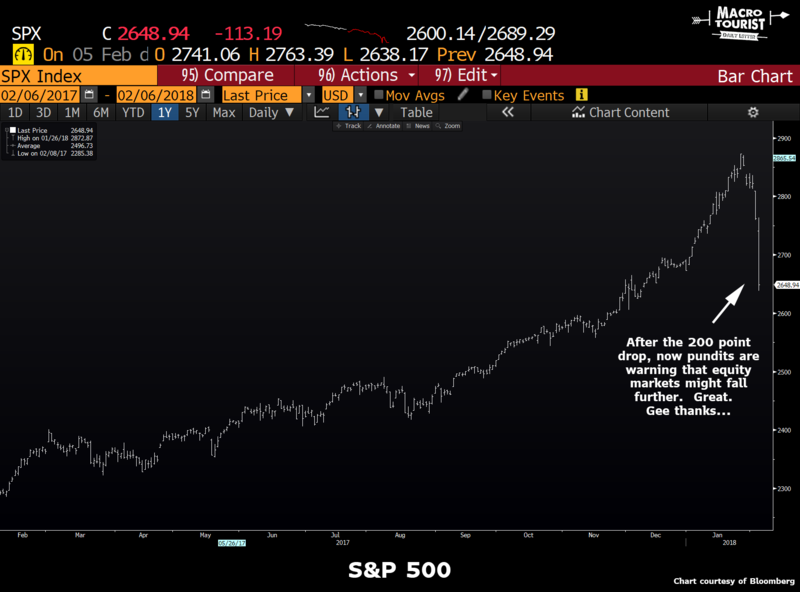 It seems like just yesterday the overly confident bulls were openly taunting any market participant that dared counsel about the increasing risks in the equity market. Yadayadayada. It’s always the same. Markets make opinions, not the other way round. All of sudden, in less than a week, the S&P 500 has given up 200 points. But what happened? Why the change of heart? Well, as much as I would like to point to a specific economic release, or some other geopolitical development, the truth of the matter is that there really was no catalyst. Equities were simply up on a stick, with everyone chasing the ever-rising market. It was made worse by the new era of electronic trading that favours VWAP or TWAP type orders that spread the buying out over the course of the day resulting in a relentless drip higher. This had the effect of tricking market participants into believing that volatility had permanently disappeared. And in today’s low alpha world, too many investors leaned on the short equity volatility trade to pick up yield. I have written about this risk extensively. The Source of the Next Crisis or Vol Sellers Branch Out are just a couple of the articles warning about the risks from selling volatility. Last night, short equity vol sellers got a lesson in getting squeezed. 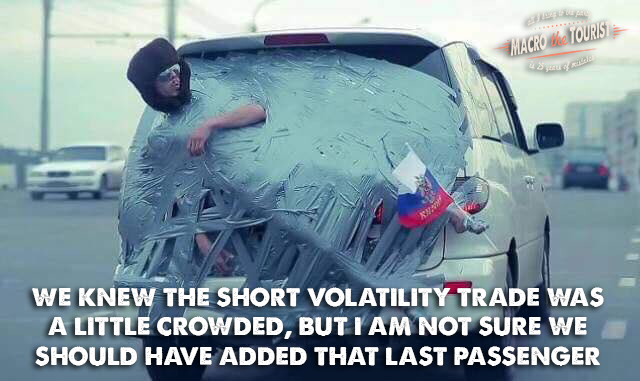 And as much as everyone wants to enter into these complicated discussions about kurtosis or the volatility of volatility, I am going to spell it out in much simpler terms. The short vol sellers were out over their skis, and the market always punishes the weak hands. 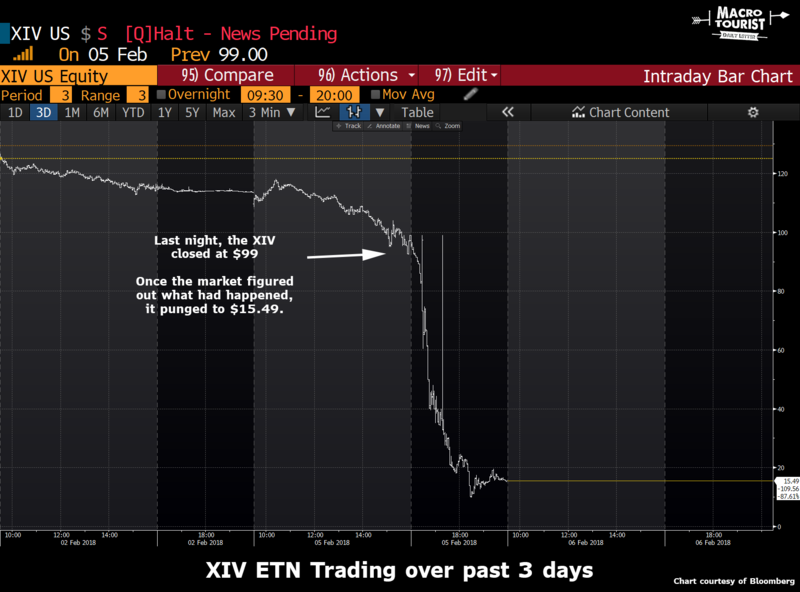 In the space of 20 minutes, VIX futures spiked to a level that was higher than 80% from the previous close, triggering the dreaded liquidation clause in the short XIV ETN. And sure enough, it appears the manager chose to exercise that right, with the market assuming the ETN will be wound down. Whereas a week ago no one could imagine the equity rally ever stalling, this morning the financial world is filled with all sorts of doomsday contagion scenarios about the short volatility collapse. And could that happen? For sure. If there is one thing that we should have learned from the recent past is that anything can happen. Yet here is an alternative thought for you to ponder. What if this was simply a case of weak hands getting shaken out? Market history is replete with examples of short squeezes that were nothing more than the stronger capitalized players taking out the under capitalized ones. 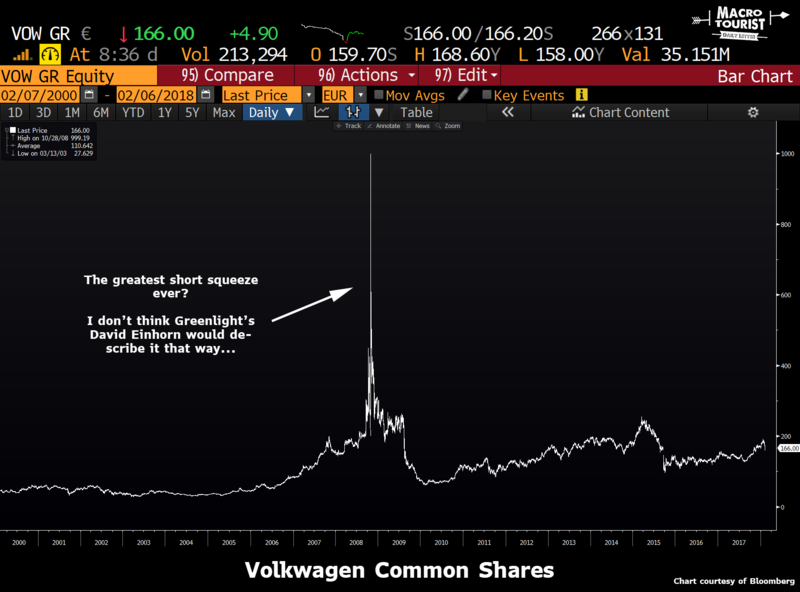 Whether it was Brian Hunter’s massive loss in obscure forward nat gas contracts or Porsche’s epic short squeeze of Volkswagen, this game is as old as the hills. It’s almost like that the stop loss for the short-volatility ETNs was a target for market participants to shoot for. But the real question is whether the move from the weak hands to strong ones has already happened. 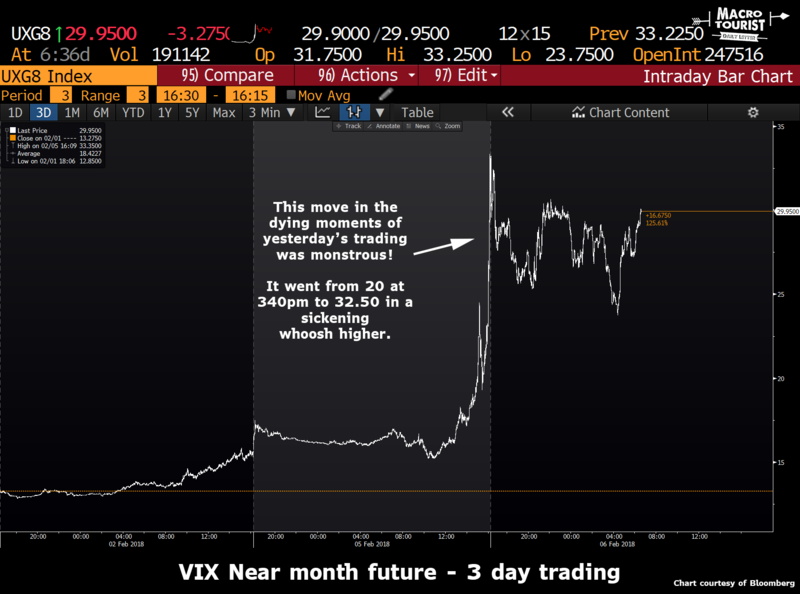 Will VIX short sellers look back at last night’s spike and kick themselves for getting stopped out? Everyone on the financial TV is soooo convinced that the vol trade is about to spiral upwards out of control. A good trader learns to never say never, but I am not as sure that last night’s squeeze won’t prove to be the top in VIX for this move.